Kris grew up in an unstable home environment and knows what it’s like to be completely alone in this world, but the cards stacked against him also fueled his drive to be successful. His mother was an addict and would abandon him for days and weeks at a time, so when he was 6 years old Child Protective Services gave custody to his father. But life did not get any better for Kris: While living with his father, he was physically and psychologically abused. Kris helped pay the bills for his family by cutting and selling firewood. “When I would come home from school, my dad wouldn’t care if I had an essay to write or a chapter to read,” he says. “It was work all day or receive a severe beating, and most of the time, it was both.” As a result, he ended his first year of high school with a 1.9 GPA. Finally, when he was 13, someone anonymously reported the abuse. Kris thought it would be best to live with another family member, but when he attended a meeting with Child Protective Services and the question “Who wants to take Kristopher?” was asked, his family remained silent. “This was by far the most traumatic experience for me, because it confirmed that I was truly alone in the world,” he says. After entering the foster care system, Kris lived with a total of three foster families. The first two weren’t the right fit, but then an older couple that was fostering three children gave him the freedom and support he needed to recover from his past traumas and set him up for success. For the first time in his life he could study hard, and he earned a GPA of 3.2. He maintained this GPA throughout the remainder of high school. “After receiving such poor grades my freshman year, I was determined to prove to everyone and myself that I was not stupid,” Kris says. But when it came time to apply for universities, he was rejected because his cumulative GPA was too low. His academic counselor helped him apply for colleges but thought it was extremely unlikely that he would get in and encouraged him to pursue other alternatives to higher education. He also could not afford it. Luckily, Kris had a social worker who informed him of scholarships that are specific to foster youth. He applied for and received every one of them, including CSF’s Washington State Governors’ Scholarship for Foster Youth. “By earning these scholarships, I earned my way to a college education,” he says. Kris spent two years at Whatcom Community College in Bellingham before transferring to Washington State University in 2014. When Kris was placed on academic probation his first semester, he panicked. He thought he was going to lose all his scholarships, but then CSF assured him that every student has at least one rough semester. 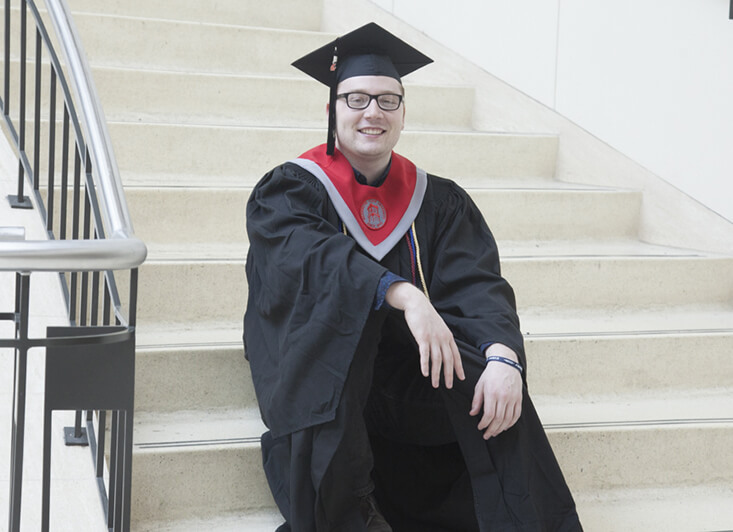 “Hearing those words made me realize that I didn’t have to be alone in college,” he says. During his third year of college, Kris became a CSF volunteer and mentored freshman foster youth. He loved it so much that he applied for a paid mentoring position the following year. CSF also continued to help him with his academic and professional career. With help from CSF, Kris applied, interviewed, and bought professional clothing for an internship at the Congressional Coalition on Adoption Institute, the number one think tank for adoption and foster care based in Washington, D.C. In summer 2016, he worked in the capitol and published a policy report on extended foster care which he presented at the White House and to members of Congress. Kris earned a bachelor’s degree in psychology from Washington State University in 2017. He credits CSF with convincing him that getting a college degree is more than possible. Kris shared his inspiring story at the annual Empowering Youth Luncheon on October 9, 2018. Watch the video of his moving remarks.